PPM MP Riyaz Rasheed caused a stir today labelling the four women MPs of the opposition “shameless” and “screaming crows.” He also said that women are the leading cause for heart attacks and strokes. A senior MP of the ruling Progressive Party of the Maldives called his female colleagues “screaming crows” during a debate on reserving quotas for women in the local councils. 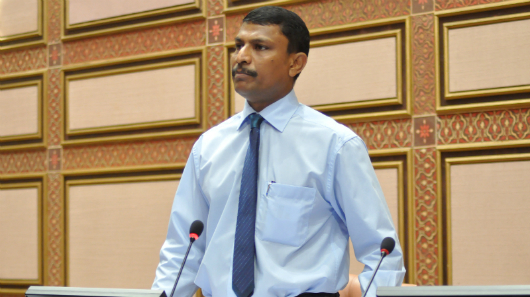 Riyaz Rasheed, the PPM’s deputy parliamentary group leader, caused a stir today labeling the four women MPs of the opposition “shameless” and saying women are the leading cause for heart attacks and strokes. He went on to suggest women left their husbands after years of marriage to be eligible for an MVR3000 (US$198) handout for single parents. 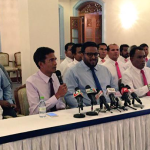 The PPM dominated parliament threw out the quota proposal with 36 votes. Only five MPs of the 85-member house are women. Four are with the opposition. The amendment to the Decentralisation Act to reserve a seat at island and city councils was proposed by MDP MP Rozaina Adam. 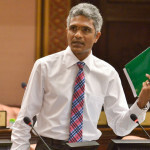 Majority leader Ahmed Nihan had spat at Rozaina’s face last month during a heated exchange over corruption allegations. Ruling coalition MPs accused Rozaina of attempting to portray the Maldives as a society that discriminates against women today. The discourse on women’s rights is resulting in girls disobeying their fathers, he said, while Jaufar Dawood of the PPM accused women who participated in protests of sexually harassing police officers. Deputy Speaker ‘Reeko’ Moosa Manik, expressed support for the bill, but only because men already suffer from jealous wives. Women must respect men, too, he said, by not falling in love with domestic servants. Asma Rasheed, the only female PPM MP, who had submitted a bill on gender equality earlier this month, mildly admonished her fellow MPs, urging them to show respect. She voted against Rozaina’s amendment. Eva wrote in a Facebook post afterwards: “Just want to say, there’s plenty more of this “shameful, unladylike” behaviour, from these “dark, ugly” women, to the best of our abilities, to uphold the Constitution and to uphold rights of the people who elected us. 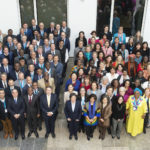 Shoko Noda, the UN’s resident coordinator in the Maldives, in an op-ed on International Women’s Day, said that establishing a quota system is critical to close the gender equality gap in the political sphere. Only five percent of the 1000 elected island and city councillors are women. President Abdulla Yameen has stressed that his government wants to empower women. Detailing his administration’s achievements this January, Yameen claimed that his MPs had amended the Family Act to allow for the equitable distribution of marital property after divorce. His spokesman later attributed the claim to a “mistake,” as the pro-government majority in parliament had sent the bill back to committee when it was put to a vote last November. The provisions on a court deciding upon the equitable distribution of marital property in divorce cases caused difference of opinion among ruling coalition lawmakers.